Create your instant privacy with this high quality Keter Ezifence. Product comes with natural wood look panels and metal reinforcement for durability. 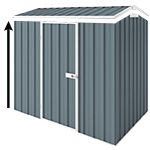 Built from 100% maintenance free UV stabilized polypropylene to withstand 170km/h winds. Ezifence kit includes 7.48m fence which is easy to put up by a DIY handyman or professional. Pack contains 3 panels, 4 posts, 4 caps, brackets and screws. It comes in the stylish Beige colour with limited lifetime warranty. Hello there, not a dumb question at all. Yes, these panels are DIY, no need for a pro to install it. The kit comes with assembly instruction that's easy to follow. Hope this helps. Cheers.